Till the very last moment when I was holding the walls waiting for the icing to set I couldn't believe the house will materialize. It is like a little miracle. You do some casual baking, cutting and mixing et voila you end up with this beauty in front of you. More than that, you find yourself actually trying to look through the door and windows, as if you were really wondering what's in there. Coming back to earth, I finally visited Victoria Agabalyan at Taste of Russia cooking school in Moscow and I can't tell you how happy this makes me. 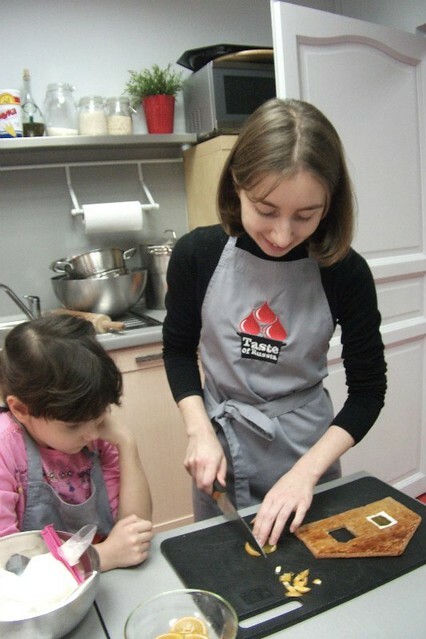 Taste of Russia is an English speaking Moscow cooking school capable of working with expats and foreign tourists besides Russians. Obviously I got interested as soon as I found that it exists. On Saturday morning I arrived at Kazarmenny pereulok and entered a comfortable studio through a green door. Smiling Victoira welcomed me in. Some 5 minutes later a beautiful primary school aged girl, Sonya and her dad joined. It was a class for kids but Victoria still let me in as I got completely crazy about ginger bread houses after I saw her pictures on Facebook. Besides running classes on house building for kids and adults Victoria makes ready house compositions on order. I couldn't imagine it was possible to build a house from scratch during just one class but it was. Victoria made the dough in advance. She explained it was simple to put together, so there was no need to do it in class. The recipe is also open on Facebook by the way. Victoria told us about Benedict, an Austrian chef working in Moscow, who shared it with her. It is particularly for houses in a sense that the ready pastry is firm enough to hold shape under weight. I didn't expect it to be tasty given that, but after I tried the cuttings of the house Victoria made the day before I found it hard to tear myself off them. "First, you need to draw your house" Victoria said. She was so calm, warm and smily that both Sonya and I felt completely relaxed and started having fun right away. We drew and cut stencils for the walls, facades, roof, cut out windows and doors. Then we rolled the dough. It had marvelous texture, very easy to work with, like plasticine. For the next hour or so we kept rolling, cutting out the components, doing egg wash (Sonya was managing this operation perfectly), baking, then rolling again, cutting, doing egg wash, baking etc. When you just take it out of the oven the gingerbread is still very soft. We let it cool down a bit and cut out windows and doors. When it cooled down completely it became firm. We quickly put together an icing made of icing sugar, egg whites and lemon juice, filled the piping bags and started decorating the walls, roof and facade. We also glazed the windows with semi translucent marmalade, using the icing as assembly foam. In the assembly process it turned out very helpful to have several adults around. While Sonya's dad and Victoria were piping out the icing and adding new components, I was holding the construction together. Victoria said the icing was "five minutes to cement", and it was really setting quite quickly. While Sonya's dad and I were standing next to the house afraid to breath on it, Sonya was happily jumping around drawing on little gingerbreads. When she was accidentally pushing us we realized how seriously we were actually taking the house and started laughing at ourselves. The last thing we did, which I loved the most, were the icicles. To make them you have to go around the roof piping out some icing on its edges and them pulling the piping bag down. To make them really long you need to let the first raw set and repeat the operation. Then the only thing left is to dust the roof with some snow, if you know what I mean. All in all in four hours the house was ready and commissioned to Sonya. Victoria told me a bit about Benedict, who taught her the technology. Besides his native Austrian cuisine he does many others including amazing Italian and South-East Asian. Among several other interesting guest chefs Benedict teaches at Taste of Russia from time to time and currently Victoria is gathering a group of students for his next class on Austrian cooking. I left filled with warm gratitude and with a wish to come back soon. For now, I'm going to build another house at home with my 12 year old brother. I just know he is going to love it. Decoration: nuts, candied fruits, smarties, marmalades etc. In a large bowl combine all ingredients for gingerbread and mix together using your hands to form an even pastry. Let stand for two hours at room temperature. Make paper stencils for the house walls, roof, base (optional) and complementary figures (e.g. christmas trees, gingerbread man). Roll the pastry 5 mm thick. Cut out the house components using your stencils (do not cut out windows and doors at this stage). Transfer the components to a tray lined with baking paper (you will probably need to do the bakin in several batches). Do the egg wash. Bake each batch at 200C for around 15 minutes (till the gingerbread just starts to turn golden on top). Take each batch out of the oven and transfer to a cooling rack. 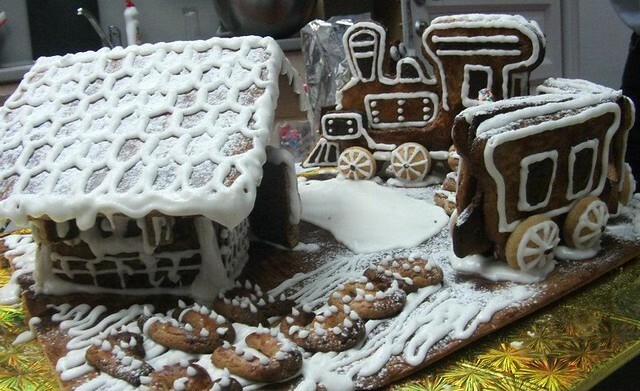 Let stand for 5-10 minutes, then cut out windows and doors (the gingerbread should still be warm and soft at this stage). Let cool completely (it will take at least 2-3 hours, but it is better to leave them overnight). To make the icing, mix together the icing sugar, egg white and lemon juice till smooth. Apply colorings (if using). Transfer to a piping bag with a round tip 3-4 mm in diameter. 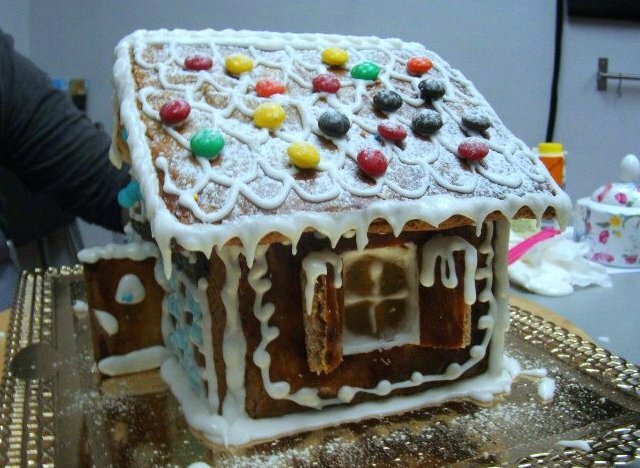 To assemble the house make the windows (we used marmalades) and decorate each of the house components as you wish. Leave for 15-20 minutes to set. Draw the house perimeter on your base using the piping bag with the icing (you can either use the base you’ve baked or a plate large enough to hold the composition). Set the walls on the lines you drew and pipe out some icing to fasten them together. Hold the walls with your hands for some 10 minutes to let the icing set. When the walls are set and standing firmly pipe out some icing on the upper edge of each wall and set the roof on top. Go around the roof with the icing to make the icicles. Then dust the roof with some icing sugar and you are done. Thanks a lot for letting know. From now on I'm probably sticking with Victoria's recipe referenced from the post. If you are in the mood for trying - highly recommend it!